Robert Heinlein said, "Never attribute to conspiracy what is adequately explained by stupidity." I think this is a pretty good rule of thumb. It's not that conspiracies don't exist; it's more that humans aren't very good at them (e.g. Watergate), and we're much more likely to be acting from venial motives -- greed, duplicity, desire for power -- than we are to be engaging in some kind of deep and sinister plot. That said, I'm beginning to wonder if the implementation of the Common Core isn't some kind of conspiracy. Let's start with the fact that the Chief Operating Officer of the South Carolina Department of Education, Elizabeth Carpentier, is threatening parents who allow their children to opt out of state tests with thirty days in jail. State Superintendent of Education Molly Spearman, asked about Carpentier's statements, declined to comment other than saying that there is "no statutory provision for parents to opt their children out of testing." Arne Duncan, Secretary of Education, has been making some veiled threats of his own. "It’s just part of most kids’ education growing up,” he said, regarding the implementation of the Common Core standardized exams. "Sometimes the adults make a big deal and that creates some trauma for the kids... We think most states will do [meet their targets for participation]. If states don’t do that, then we have an obligation to step in." So the implication is that everything is just hunky-dory with the Common Core curriculum and the tests, and the only parents that will opt out are overprotective mommies and daddies who can't stand to see their kids work hard. Oh, and those mommies and daddies might have to go to jail if they allow their kids to opt out. The 6th grade ELA practice performance task for the Smarter Balance was completely inappropriate for 11-12 year olds, requiring them to toggle between several screens (on small Ipad screens), and choose multiple pieces of evidence to evaluate, select, paraphrase, compare and contrast, as well as write a multiparagraph essay. Never mind that while practicing, toggling back to the articles caused the students’ written work on the essay to be erased (lost). 1) There is no proven Construct Validity (does your test measure what you think it measures). 2) Cut scores are determined by an unknown (arbitrary) process - labeling children as proficient or failing appears to not be based on any scientific process. It is not scientific to arbitrarily decide what levels of your test scores actually mean in the real world. Scientific measurement requires cross-validation with external measures that provide evidence for your claims (like grades, or independent in-depth measures of children’s educational achievement in a a smaller sample with highly experienced evaluators). 3) Computer adaptive tests - there have been many concerns raised about how item difficulty has been decided. Children continue to progress on these tests if they continue to get a certain number the most recent answers correct. Educational measurement specialists (true academically trained professionals) and parents and children have observed that very often items following very difficult questions are significantly easier. This raises concerns that children’s scores are artificially deflated by unscientifically determined item difficulty determinations. 4) Inter-rater reliability - No checks exist to independently determine whether the scoring administered by these testing companies has truly reliable and valid measurements of children’s answers... The assessments are not verifiable, because they are not permitted to be subject to independent scientific evaluation. I’d like to tell you what was wrong with the tests my students took last week, but I can’t. 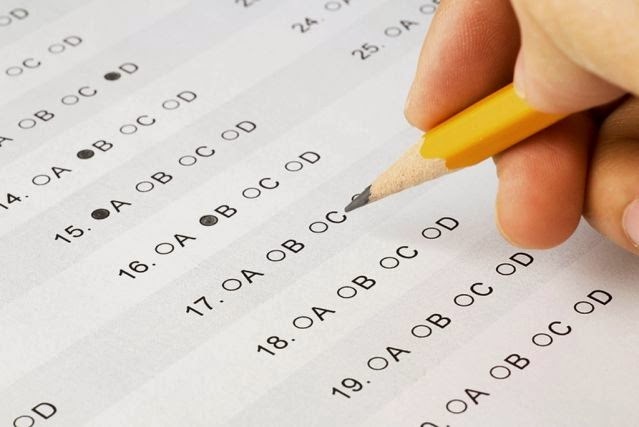 Pearson’s $32 million contract with New York State to design the exams prohibits the state from making the tests public and imposes a gag order on educators who administer them. So teachers watched hundreds of thousands of children in grades 3 to 8 sit for between 70 and 180 minutes per day for three days taking a state English Language Arts exam that does a poor job of testing reading comprehension, and yet we’re not allowed to point out what the problems were. But some educators care more about their students than they do about threats of repercussions by a rich corporation who is pulling the strings of upper-level administration in every state in the United States... and those educators have uncovered some frightening facts. For example, a teacher who (understandably) wants to remain anonymous performed a reading-level analysis on a passage from the 4th grade ELA assessment, and found that it had a lexile score of 1140 -- corresponding to appropriateness for the average reading ability of an 8th grader. There is a man in Albany, who I surmise, by his clamorous paroxysms, has an extreme aversion to educators. He sees teachers as curs, or likens them to mangy dogs. Methinks he suffers from a rare form of psychopathology in which he absconds with our dignity by enacting laws counterintuitive to the orthodoxy of educational leadership. We have given him sufferance for far too long. He’s currently taking a circuitous path to DC, but he will no doubt soon find himself in litigious waters. The time has come to bowdlerize his posits, send him many furlongs away, and maroon him there, maybe Cuba? So yeah, I'm beginning to think there's more here than simple incompetence. The people in charge are not stupid, and one thing these people excel at is number crunching. I flatly refuse to believe that the inclusion of a passage that is four grade levels too hard in the ELA assessment was a simple blunder. Which leads us into into some scary territory, because that implies that the other problems may not be accidents, either. But why would Federal and State Departments of Education, with the collusion of a lot of elected officials like our own aforementioned governor, do this? Cuomo himself tipped their hand earlier this year, when he said that he wanted to change the teacher evaluation system -- because too many teachers were achieving high scores by the previous metric. So the reason for all this, I believe, is that the powers-that-be are deliberately setting students up to fail, in order to show up public education itself as a failure -- in an effort to destroy the entire edifice. Replacing it, more than likely, with a network of charter schools that are run by privately-chosen (i.e. not elected) boards, and which will have a vested interest in buying in to programs, curricula, and assessments created by for-profit corporations like Pearson. The whole thing, I think, boils down to money, and who is lining whose pockets. So in the end, it does turn out to be venial motives -- greed and political power. I could be wrong. It might be that what we're looking at is the educational equivalent of the Keystone Kops, running around frantically and bonking into walls and falling over. That's certainly what it looked like at first. But now, with the time we've had to smooth over problems, develop exams, streamline administration, we shouldn't be seeing these kind of mistakes. Giving so many tests might still be a mistake, of course; but the fact that the exams themselves are so deeply, fundamentally, and obviously flawed, coupled with the gag order against discussing them, has the hallmark of deliberate downward manipulation of the scores. Which means that it is even more important for parents to defy the threats, and opt their children out, and for educators to come forward with the content and administration problems of the exams themselves. Public education itself might be at stake.